CAMPAIGN UPDATE: Although Danilo’s voluntary departure expired July 5th, he decided to stay to contest his deportation. Thanks to all the public pressure, outpour of solidarity and letters of support, victory is in sight for Danilo. After having been denied prosecutorial discretion before July 5th, ICE indicated they would consider a “Stay of Removal,” putting a hold on his deportation. While a Stay of Removal would be a tremendous triumph, there is a better option for Danilo. On July 10th, he filed his application for a stay of removal and also a request for deferred action, which would give him a chance to apply for a work permit and the possibility to travel to see his ailing mother back home. Read more about Danilo’s story and legacy below, and please sign this UPDATED petition asking ICE to grant Deferred Action so that Danilo can remain in the country to continue his civil rights work in Vermont. Danilo’s Story: Daniel Alejandro Lopez Santiago, (A089-088-623) known as ‘Danilo’ by his friends, is a farm worker and leader with the Vermont community group, Migrant Justice. 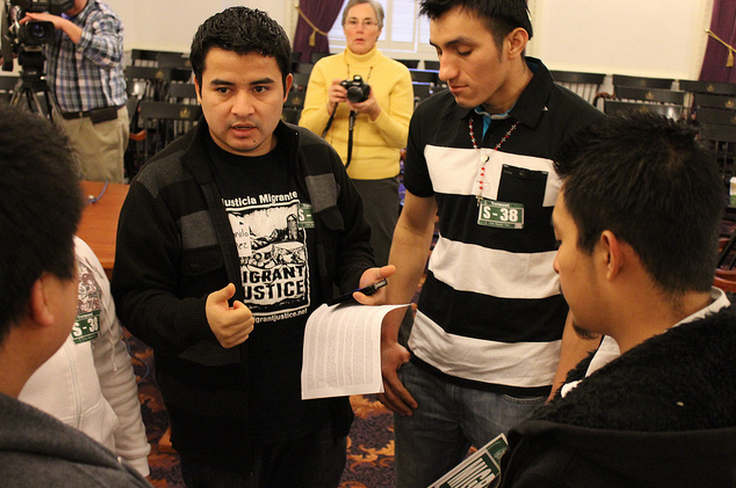 In 2011, just three weeks after leading the first ever migrant farm worker press conference and rally at the Vermont state house, Danilo was placed in deportation proceedings. For this, and his continued activism, Danilo was recognized as the “Vermont Human Rights Hero” of 2011 by the Vermont Workers’ Center at a conference of hundreds of community leaders at the University of Vermont. Throughout his organizing he has continued to fight his deportation case in court, and has continued to fight for immigrant and farm workers rights, including leading the successful campaign for equal access to Vermont Driver’s Licenses. However, he lost his immigration case in court and his request for prosecutorial discretion was denied. Danilo was told he must leave the country by July 5, 2013, but he decided to stay and request deferred action and, as a second option, a stay of removal. Please sign this UPDATED petition asking ICE to allow Danilo to stay in the country and continue to be a human rights leader.